I've found peace and quiet sitting in a dark room gazing into the lights of my Christmas tree while holiday songs play quietly in the background and while sitting around a table surrounded by family and friends, the sort of peace that settles into my heart causing me to sigh contentedly knowing I have everything I need and so much more. I've felt inner peace as I've thought about some of the decisions I've made this past year, knowing that while not everyone approved, they were the decisions that were the absolute best for me at that moment in time. I've made peace with some situations that are beyond my control, knowing that letting go while still putting one foot in front of the other is a victory in its own way, it brings a serenity that heals my broken spirit in numerous ways making me feel whole again. I am at peace with myself when I realize its perfectly ok that I didn't accomplish everything I've set out to do, that sometimes life gets in the way and happens faster than any one of us can even realize. Sitting in the dark looking at lights always brings me peace too. There's something so hopeful about Christmas lights. I'm glad you've found peace. Those kind of revelations are the moments you will always come back to. What a lovely post. This really is the essence of the holidays, Mandy. Thank you! I wish you had this kind of peace all the time, but I'm so glad that you found it just in the nick of time! merry christmas to you lady! i'm glad you found your peace, love. and i hope it continues through the next year. This is so lovely. I'm glad you found some peace. I'm searching everywhere for mine. i adore that photo!! merry christmas!! A perfect segue into the year of you. i like peace...so thanks for the gift, mandy! you're such a peaceful writer. you always make me feel at ease. thanks for that. I am so very happy for you! here is to a peaceful 2010!! Hope you enjoyed your Christmas with loved ones. 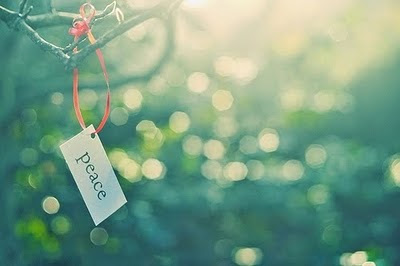 Peace is the very, very best feeling in the world, I think. I am so glad that you are feeling some! Hope you had a great Christmas! Aww god this post made me tear up because I need to follow your lead and find peace with not accomplishing everything I want to in a year. You're such a good role model of that. Hope you had a great holiday. XOXOXO. Lovely post - as I've said in recent comments, I have been searching for a sense of peace. I definitely felt it when I was home. It was just nice to have some time away from the hustle & bustle of my life here & just enjoy time with family. Totally reminded me of what is most important in life! !